Now you can have the power of visually connecting ideas and information right at your fingertips. Mindjet for iPhone brings your ideas to life allowing you to create, view, edit, upload and download mind maps anytime, anywhere on your iPhone or iPod touch. Mindjet for iPhone works with MindManager® for PC, Mac, and Web giving you ultimate flexibility and full access to the same information from your iPhone or desktop. Mindjet for iPhone is built for individuals who want a quick, intuitive way to capture and communicate information and ideas as they emerge. 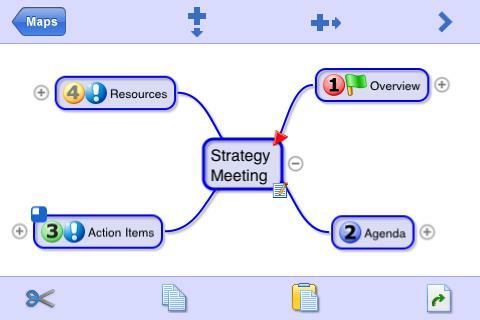 •	Share your mind maps with friends and colleagues or transfer them to your PC or Mac. •	Import from Freemind (.mm), OPML (.opml) and MindManager (.xmmap) file formats. •	Export to MindManager as .xmmap files, which can be opened directly within MindManager.